By "put down" I really mean bash. What a disappointment. I was really looking forward to this game. When GameFly‘s email said they’d shipped it last Friday, I checked the mail Monday for that nice square envelope. It had come, and unfortunately not a bit sooner. 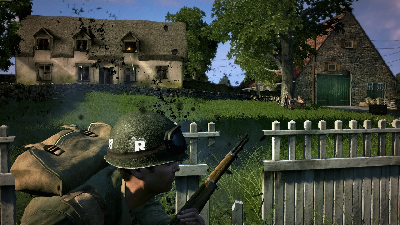 My first impression of the game was that it was an accurate WWII title using the Unreal Engine. Two promising features right there. I pop the game in, enjoy some openings and titles, and get right to action. First off, the graphics are truly something else. Gearbox makes great use of the engine as far as texturing and lighting, models, and dynamics. As far as animation goes, they suffer from what I’ve noticed a lot of developers have from these days. They focus on major movements like actions that motion capture picks up and leave out the important stuff like facial animations. 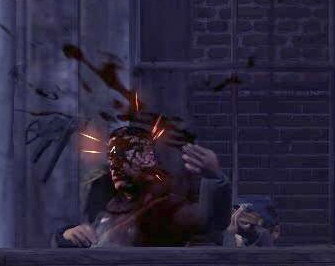 Downed enemies look like mannequins on warehouse shelves, with no interaction or rag doll effects to even play with. Most of the dialogue that takes place in the opening movies is yelling; however the characters’ facial expressions remain calm and placid, rarely opening their mouth as wide as a yawn. It’s not hard at that point to figure out where they put their efforts. BLAM! A cinematic piece you are rarely afforded. Gameplay is something similar to that of Rainbow Six: Vegas, which is awesome, but the control scheme doesn’t match it at all. Controls felt misplaced and clunky. There wasn’t any way to come out from cover and start running without returning to the original cover position, moving away from the cover, strafing left or right, then sprinting. I also often found myself commanding my squad to go on a suicide mission instead of chucking a grenade, and chucking grenades instead of doing something else, like reloading. Which, I might add, is completely manual. ( Game Realism + 10pts | Game Fun & Pace - 20pts ) Everything just really felt out of place. Squads are a feature that has recently become a norm for most first-person-shooters in the latest generation of consoles. It’s really not a difficult concept. But when you do deploy it in your game you really need to make sure it works. Now, I’ve read reviews and comments on the squad system and how covering fire and flanking is really the way to do it, but sometimes these guys are just plain stupid. Standing up to fire the mounted machine gun while taking hits is not heroic, it’s moronic. They don’t work for themselves! That’s what I think the real problem is with HH’s system. In games like Gears or Vegas the squads fight for themselves, but they can also take orders. Really not a difficult concept. Hmm...I remember this level. It was the one right before I took the game from my 360, put it back in the envelope it came in, and sent it right back to GameFly!